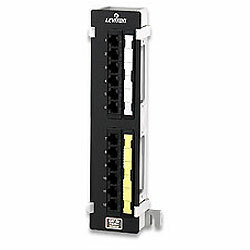 Category 5e patch panel mounted on a 89 bracket with 12 ports densities (connectors in groups of 6) to meet the needs of high-speed data applications. Ideal for enhanced applications and can be used for T568A or T568B wiring configurations. Accommodates top, bottom or side cable entry. Rated for both channel- and component-level performance.